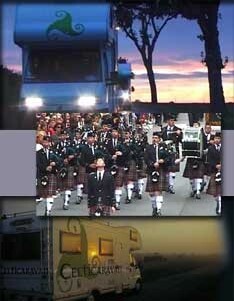 "Celticaravan: le più belle feste celtiche d'Europa"
A journey through time, places, music and everyday life in search of Celtic heritage in modern day Europe. From Hallstatt, where the first Celts settled, to Lorient, where the largest modern gathering takes place, the itinerary takes in thousands of kilometres. The journey was made one summer, in the two "Celticaravans" that travelled to the Czech Republic, Germany, Austria, Switzerland, Italy, France, England, the Isle of Man, Cornwall, Wales, Scotland, Ireland and Spain. We chose to view first hand the existence of a shared European feeling based on common ancient traditions by travelling from country to country, over a short period of time, following a trail of archaeological sites and festivals. From Bohemia to Spain via Germany, Austria, Italy, Switzerland, France, Ireland, Scotland, England, the Isle of Man, Wales, Cornwall, Brittany, Asturias and Galicia: the journey enabled us to compare distant places over a short space of time and proved the best method for our research. This first cassette includes all the festivals that Celticaravan went to: Teotoburgo, Lorient (France), Prague, Trigallia in Argenta, Celtica Courmayeur, William Wallace Day in Scotland and many more magical locations.